Serving breakfast, lunch and dinner with a southwest flare. 2 Eggs, toast, home-fries & choice of meat. 1 egg, bacon, and cheese on English muffin. Light and fluffy served with real maple syrup. Upgrade and add a choice of meat. 2 eggs filled with a mix of cheese, served with your choice of toast. 2 soft poached eggs atop thick cut peameal bacon and toasted english muffin coated with creamy hollandaise sauce. 2 eggs, ham, onions, and green peppers served on your choice of bread. 2 soft poached eggs atop our panfried homefries sauteed with onions, peppers and bacon, covered in cheese and creamy hollandaise sauce. 2 eggs, bacon, ham, sausage, cheese. served with home-fries and choice of toast. Scrambled eggs, bacon, refried beans and cheese wrapped in our fresh pressed tortilla topped with mexicana sauce & mixed cheese, served with our home fries, pico de gallo, sour cream & guacamole. 2 eggs, peppers, onion, tomato. served with home-fries and choice of toast. 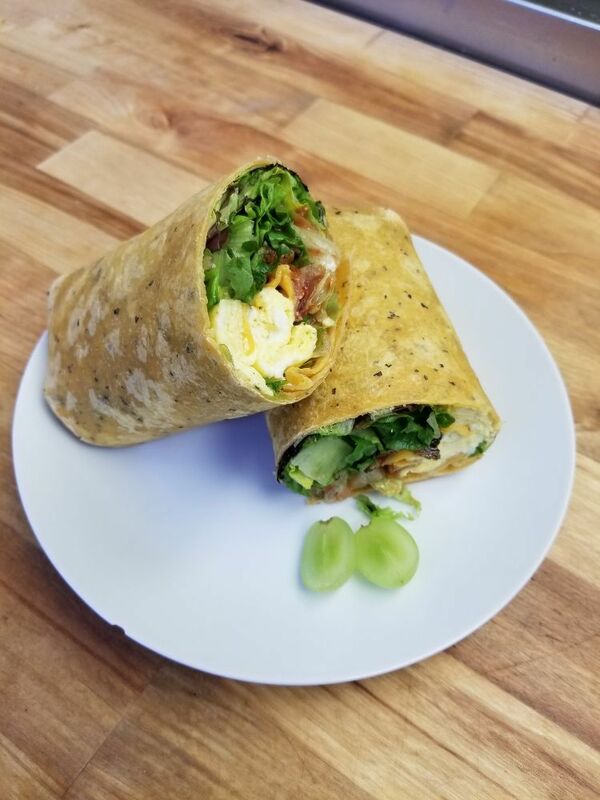 2 eggs scrambled, bacon, lettuce, cheese and salsa in a fresh tortilla. A choice of sesame, everything, cinnamon raisin, blueberry. Lightly toasted. White, Brown, Rye, and Gluten Free. Fresh made chips with homemade salsa. Homemade guacamole with fresh corn chips and warm tortilla crisps. Seasoned fried chicken breast pieces, served with fries and our white pepper gravy. Fresh corn chips piled high and topped with a mix of cheeses, pico de gallo, and green onions, served with salsa and sour cream. Upgrade by adding pulled chicken or ground beef. Fresh flour tortillas stuffed with seasoned pulled chicken, fried and served with garlic cilantro dip. Garlic baked mushrooms topped with mozzarella and goat cheese. St. Albert’s cheese curds, battered and fried. Served with homemade marinara. Served with our homemade garlic cilantro dip. Fresh flour tortillas stuffed with a blend of cheese, Pico de Gallo and choice of grilled steak or chicken, served with salsa and sour cream. Choice of wet or dry. Classic BBQ, medium, hot, sweet chili, honey garlic. Maple, mango habanero, salt & pepper, lemon pepper, Cajun. A huge platter filled with quesadillas, guacamole, warm tortilla crisps, chicken flautas, and fresh cut fries. Served with salsa, sour cream, and garlic cilantro. Served with warm tortilla crisps. Fresh greens topped with tomato, cucumber, green onion, and croutons. Fresh cut romaine tossed in dressing, with real chunks of bacon, croutons, and Parmesan cheese. Our classic Caesar served with fresh grilled steak and fresh tortilla crisps. Our chef salad served in a crisp taco bowl topped with cheese and choice of seasoned ground beef, pulled chicken, or avocado slices. All fajitas are served on a sizzling hot skillet over a bed of Spanish onion and green peppers. Served with our signature rice, shredded iceberg lettuce, cheese, sour cream, pico de gallo, and our fresh flour tortillas. Two fresh flower tortillas stuffed with a choice of seasoned ground beef or pulled chicken. Topped with lettuce, pico de gallo, cheese and garlic cilantro. Served with our signature rice and choice of side. Two fresh flour tortillas stuffed packed with crispy fried cod pieces, topped with coleslaw, lettuce, and cheese. Served with tartar sauce, rice and choice of side dish. A large flour tortilla stuffed with seasoned pulled chicken and cheese, fried and topped with Mexicana sauce and then baked with more cheese. Served with sour cream, rice and choice of side dish. A tender steak grilled to your liking, served with coleslaw, choice of side and a thick slice of garlic toast. Homemade chicken strips tossed in BBQ sauce, served with coleslaw and choice of side and garlic dip. Freshly Battered cod fillet, served with coleslaw and fresh cut fries and tartar sauce. A blend of Cheeses topped with pico de gallo and seasoned ground beef. Served with fresh flour tortillas and our signature rice. Freshly breaded chicken breast smothered in country pepper gravy, served with coleslaw, choice of side and a thick cut garlic toast. Our special blend of macaroni noodles, cheeses ad spices. Served with garlic toast. **Add seasoned ground beef, pulled chicken, or bacon. Kerry’s Famous Hand-pressed Burgers & Homemade Sandwiches & Wraps. A large flour tortilla stuffed with your choice of seasoned ground beef or pulled chicken, topped with refried beans, rice, pico de gallo, garlic cilantro sauce and a mix of cheeses. Our classic burger grilled with Janna’s BBQ sauce, toppped with caramelized onion and peppers, cheddar cheese, bacon and onion rings. Our Classic burger seasoned with peppercorn, topped with Habanero Jack cheese and onion rings. A fresh half pound beef patty, grilled to perfection. **Add cheddar and bacon. A classic burger brushed with Janna’s BBQ sauce, topped with Habanero Jack cheese and sautéed mushrooms. A fresh kaiser stuffed with chicken breast, bacon, tomato, lettuce, cheese and mayo. A garlic toasted sesame bun topped with grilled steak, sauteed mushrooms, BBQ sauce, jack and cheddar cheese. A breaded chicken breast served on a toasted sesame bun with mayo and all the fixin’s. A large flour tortilla stuffed with grilled chicken breast, Caesar salad, bacon chunks, and Parmesan cheese. Breaded chicken strips, tossed in Janna’s BBQ sauce, caramelized onion, lettuce, tomato, cheese and mayo stuffed into a large flour tortilla wrap.